Bringing together essays by museum professionals and academics from both sides of the Atlantic, Art and its Publics tackles current issues confronting the museum community and seeks to further the debate between theory and practice around the most pressing of contemporary concerns. Brings together essays that focus on the interface between the art object, its site of display, and the viewing public. Tackles issues confronting the museum community and seeks to further the debate between theory and practice. Presents a cross-section of contemporary concerns with contributions from museum professionals as well as academics. Part of the New Interventions in Art History series, published in conjunction with the Association of Art Historians. Andrew McClellan is Associate Professor of Art History at Tufts University. He is author of Inventing the Louvre: Art, Politics, and the Origins of the Modern Museum in Eighteenth-century Paris (1999). 2. 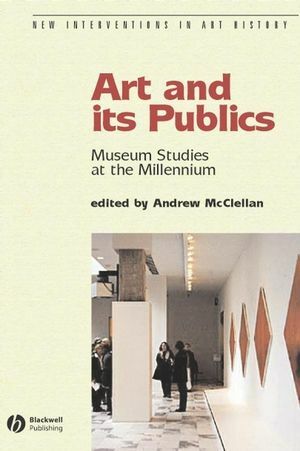 A Brief History of the Art Museum Public: Andrew McClellan (Tufts University). 3. Having One’s Tate and Eating It: Transformations of the Museum in a Hypermodern Era: Nick Prior (University of Edinburgh). 4. Museums: Theory, Practice and Illusion: Danielle Rice (Philadelphia Museum of Art). 5. Norman Rockwell at the Guggenheim: Alan Wallach (College of William and Mary). 6. The Return to Curiosity: Shifting Paradigms in Contemporary Museum Display: Stephen Bann (Bristol University). 7. Museum Sight: Anne Higonnet (Wellesley College). 8. Sacred to Profane and Back Again: Ivan Gaskell (Fogg Art Museum, Harvard University). 9. From Theory to Practice: Exhibiting African Art in the Twenty-first Century: Christa Clarke (Neuberger Museum of Art, SUNY). 10. Reframing Public Art: Audience Use, Interpretation, and Appreciation: Harriet F. Senie (CUNY).